The Raised Row Gardening Book, The Ultimate Guide To Simple Gardening! Our Raised Row Gardening Book is now a reality! When we first began our little experimental raised row garden seven years ago, we never imagined how truly fun and simple gardening could really be! The advantages of raised row gardening are almost too good to be true. 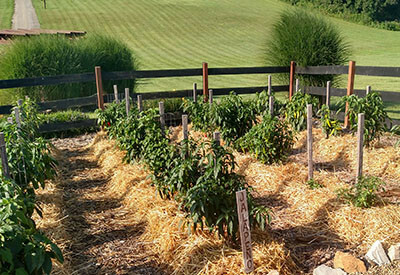 A raised row garden is inexpensive to create, and easy to maintain. Long gone are the days of hours upon hours spent digging, hoeing, raking and weeding! When it comes to maintaining, the beauty of the raised row system is that it keeps the work concentrated to only the growing areas, so there is minimal weeding and watering. With about 10 minutes a day – you can easily keep your raised row garden in tip-top shape without the use of expensive sprays, soil additives – or a rototiller! The Raised Row Gardening Book – Putting It All Together! So when Page Street Publishing (a division of McMillan Publishing) approached us last year to write a book putting the entire concept together, we were all in! Our Raised Row Garden – which supplies us with 3/4’s of our family’s food. For the past 12 months, we have worked with the editors and photographers to put every concept of the Raised Row Gardening method together. It has been one amazing experience, and one that we really hope will help so many gardeners to create the ultimate low-maintenance vegetable garden they have always wanted. The Raised Row Gardening book integrates the entire gardening system in a step by step, easy to reference format, with tons of new tips and information. The book can be ordered now on Amazon, Barnes and Noble, and Indiebound. Orders and book reviews are a huge help in promoting the book to distributors, so thank you so much to all of you who have ordered a copy or left us a review on Amazon. For us, it is truly a dream come true to put the Raised Row Gardening book together! Are You A Raised Row Gardener? 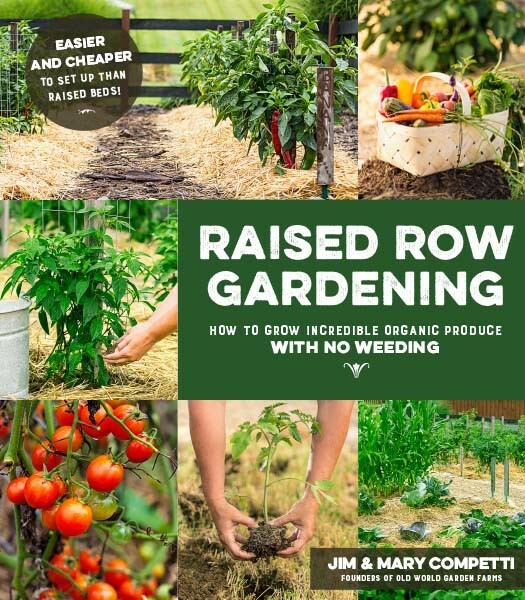 So – to our fellow Raised Row Gardeners and followers – we would love to add a few testimonials in support of our book, and we would love to hear from you! Let us know below in the comment section about your own Raised Row Garden and how it has made gardening easier for you. You can also head over and leave a review on any of the sites above as well. It really helps us to promote the book, and this great and fun way to garden! Happy Raised Row Gardening! -Jim and Mary. ← No-Till Garden Cover Crops, How To Stop Next Year’s Weeds This Fall! What perfect timing! I can’t wait to dig in to your book and savor it all winter long as I await the creation of our first raised row garden in the spring. Kudos to you for sharing what you’ve learned and thanks for the generosity in teaching others. I found your website 4-5 years ago, around the same time that we found the Back to Eden film. Using the principles of both methods have made gardening must more enjoyable and rewarding. We have moved a number of times but are now on our 3rd season in our current location. It’s been really exciting to see our yields increase as we build fertility. Our first garden has raised rows that are layered with compost, grass clippings and hay. The walkways are kept in wood chip mulch. Aside from when we seed or transplant we hardly ever water. This has been a dry summer for us but things have done great without supplemental water because of all the water retention we have built up in the rows. For the first time I am getting the bumper crop of tomatoes that I have wanted for so long and we’ve been busy canning lots of goodies for winter. It’s been a joy to use your Raised Row Method and I am always sharing with anyone that has an interest in gardening. As a mom with small children I also appreciate that this method makes it very easy to see where to walk and we have been able to teach the children not to walk on the planting rows too much. We couldn’t be happier and will continue to garden this way in the future. Thank you for sharing your wealth of knowledge through your blog and now your book.